It has been about 3-4 months since I did an empties post and unfortunately in that time I haven't used up many products. I've only managed to use up 5 products, I thought that was enough products to do a post though. 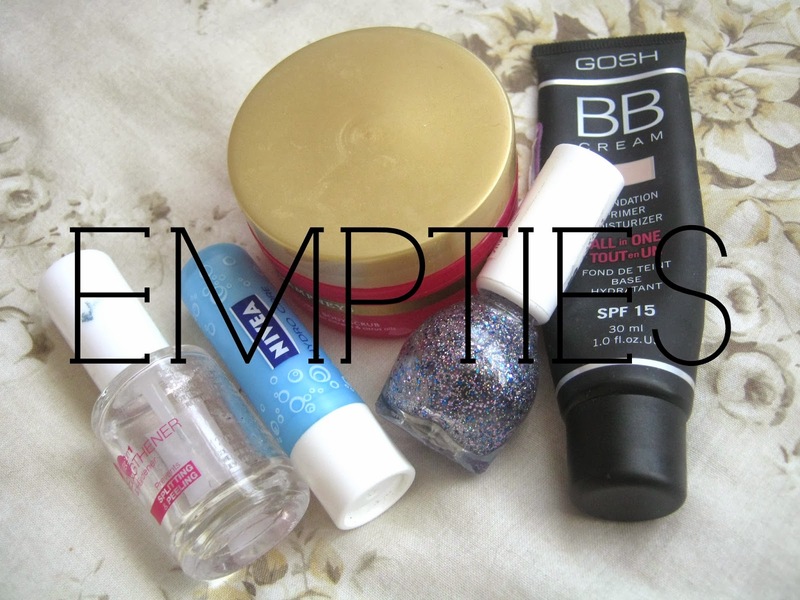 I don't seem to be very good at finishing products but I haven't been buying beauty products recently so hopefully they'll be more products featuring in my next empties post! Firstly I've finished 2 nail polishes recently. The first one is Collection's 2 in 1 Strengthener and Hardener nail polish which still has a little product left in it but it is too stringy and gloopy to use. I liked it but didn't think it was anything special, I'm still searching for the perfect base coat and top coat. The second nail polish is a favourite of mine, Miss Sporty's Sparkle Touch Nail Polish which is a gorgeous glitter which I've used and loved for so long. I'm definitely going to pick up another one of these, especially as it only costs £2! This is a product I used up quite a while ago, it is a mini size of Champneys Spa Indulgence Distant Shores Body Scrub which really didn't last long after I bought it. This product smells amazing, it is one of my favourite scents, I will definitely be picking up a bigger size of this! I think Champneys have a gift set out for Christmas which has the Distant Shoes mini body scrub, shower mousse, bubble heaven and body butter for £12 (buy here), I'll definitely be checking out the boxing day sale at Boots. Recently I finally used up my first GOSH BB Cream, I've already got a back up of this waiting! I really love their CC Cream but I do still go back to the BB Cream. It is pale enough for my skin and glides on easily and looks really natural. It gives light to medium coverage, so it definitely isn't for someone who likes lots of cover but for someone like me who prefers a more natural low cover look it is perfect! It has lasteda while as well, maybe 8 months? The last product is one that has featured in previous empties posts, I've once again finished another Nivea Hydrocare Lip Balm, I think that was my 4th one maybe? I've got a back up of this moisturising lip balm but recently I've gone off it and I've been using my EOS summer fruits Lip balm more. Oh the Miss Sporty polish looks really nice! I'm awful at using up anything.. The only thing I ever seem to come close to finishing is shampoo or conditioner! I've just finished some of my Soap & Glory products :( ! The Champneys scrub sounds good!